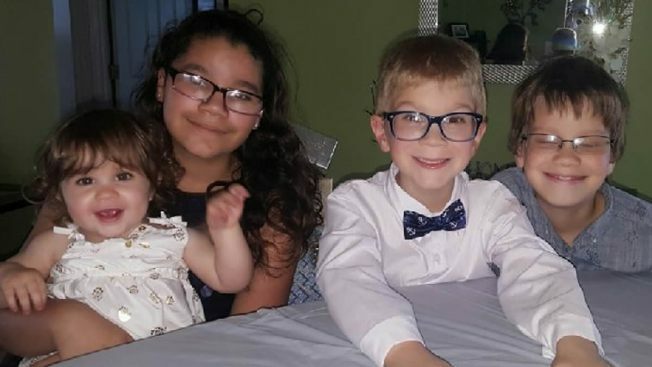 In a statement through a family spokesman, Lopez said she wants her children, ranging in age from 1 to 11, to be remembered as loving and "full of life"
Iraya de 12 años, Lillia de 10 años, Aidan de 6 años, y Dove de 1 año. Detectives believe Gary Lindsey shot the children either shortly before or after police officers came to the door of his apartment. Lindsey fired at the responding officers, seriously wounding Officer Kevin Valencia, who is in a coma but has shown signs of responsiveness. A felon shot four children in their sleep at the start of a 21-hour standoff that also left an Orlando police officer in critical condition with a head wound, authorities said Thursday. Detectives believe Gary Lindsey shot the children either shortly before or after police officers came to the door of his apartment late Sunday in response to a domestic battery call from his girlfriend, according to a statement released by the Orlando Police Department. Lindsey fired at the responding officers, seriously wounding Officer Kevin Valencia, who is in a coma but has shown signs of responsiveness. Lindsey then holed up in the apartment for almost a full day. Officers found him dead in a closet when they entered the apartment about 9 p.m. Monday. Lindsey's girlfriend, Ciara Lopez, was the mother of all four children, and Lindsey, 35, was the father of two children. When authorities entered the apartment, two of the children were found in one bedroom, and the other two were found in another bedroom. The medical examiner on Wednesday reported that the children were killed by bullets from Lindsey's handgun, not from the exchange of fire with officers, Orlando Police Chief John Mina said. In a statement through a family spokesman, Lopez said she wants her children, ranging in age from 1 to 11, to be remembered as loving and "full of life." Family spokesman Walter Benenati said money is being pledged to help cover funeral expenses.